This past spring, a quirky little ghost story debuted in Japan. At its core, Dusk Maiden of Amnesia is a often lighthearted look at love, devotion, friendship and ghost hunting, set up with some lovely art and haunting music. But beneath the aesthetic surface lies a deeper storyline that reflects a long history of Japanese ghost culture and afterlife belief, which is often absent from similar stories. The reason why? Unlike so many other shows, Dusk Maiden tells a ghost story from the point of view of the ghost. This doesn’t become apparent from the beginning. 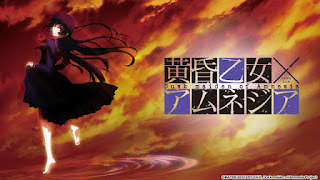 The first five episodes could best be called “formulaic:” we are introduced to the unconventional relationship between ghostly Yuuko and human Niiya; we discover the tasks and activities of the paranormal investigation club they run: we meet Yuuko-lookalike Kirie (who just so happen to be Yuuko’s great niece) and the oblivious Okonogi...it isn’t until the latter half that things start taking a turn for the dramatic. The setup itself is also fairly “standard:” Yuuko, a wayward yuurei with a horrid case of amnesia, recruits Niiya to help her discover large chunks of her past that are missing from her memory. This Yuuko we first meet is both precocious and sociable, lavishing attention on those few people who can see her, while playing tricks on Okonogi- a girl who wants to believe so badly, yet does not have the ability to see anything beyond the mundane. Through a series of “club activities,” she discovers bits and pieces of her history, usually tied to local lore about a haunting at the old school building. Yuuko herself is tied in with several “curse legends,” detailing an angry spirit answering to that name who seeks to cause pain and torment. While this is a far cry from the playful Yuuko we see in the beginning, by the end of the series it becomes apparent that there is truth in those old tales. See, unbeknownst to Yuuko (and the viewer), the core of the story is less “let’s discover Yuuko’s memories” and more “sometimes there’s more than one type of ghost.” Allow me to explain a bit more in detail. A lot of ghost tales tend to focus on either a) the outlandishness of the ghost in general, b) the emotions (usually terror) that they inspire or c) serve as "warning devices" against certain perceived sins or aberrant behaviors. In this way, they often cast the ghost as either a faceless entity to be overcome, or a wailing relic from another age that needs to be pacified. Rarely are the motivations of the ghost itself explored, let alone its personality, wants/needs and personal “saga,” because the ghost is more a plot device, or an adversary to overcome. The main point that sets Yuuko apart from these “faceless relics” is that we not only experience Yuuko’s story, but we actively take part in it. What Yuuko and Niiya don’t know from the get-go is that there’s a second Yuuko running around. The other Yuuko (or Kage-yuuko as she’s known), is angry, malevolent and more than willing to cause the same terrors that Yuuko herself is afraid of. While the Yuuko we see is plainly a yuurei, or wandering spirit, this Kage embodies the notion of the shadow flawlessly- her rage and deep seated hatred of the world creates a textbook onryou, who sows discord and torment among anyone unlucky enough to cross her path. Add to that the frequent meddling in the playful Yuuko by her shadowy other half, and we see two halves of the same spiritual force in constant interaction, with one going so far as to develop an extreme defensive mechanism against intrusion by the other. But that’s not the only way the show meddles in the affairs of the land of the dead. 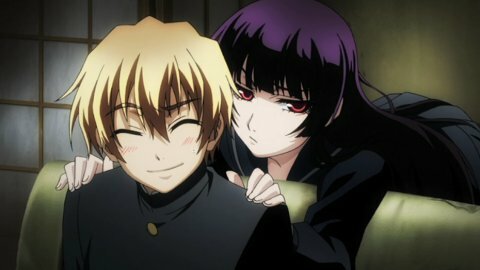 During a sequence of episodes in the latter half of the series, Niiya comes face to face with this Kage-yuuko, experiencing the world through the eyes of a hate-spirit. It culminates in his transportation to the distant past, to a world where disease and fear has gripped his small town. Firmly grounded within Yuuko’s world, both Niiya and the viewer gain an unprecedented look at her emotional state, her motivation, and her devotion to family and friends, right up until the moment of her death. We get a glimpse of a soul slipping away into torment, broken apart by fear. Here is where Dusk Maiden shines- we get to see the process by which Yuuko becomes onryou, through her own eyes, in her own time. Not a vague description, or an allusion to a greater evil, but a real time unveiling of death and torment, and the creation of the monster born from hate. The idea of the vengeful spirit, overcome by its anger and swallowed by tremendous regret, is a powerful storytelling tool, often used to terrifying effect. But to humanize it, and give the viewer a stake in the outcome of Yuuko’s tragedy, places Dusk Maiden on a different path than a “typical” ghost story. It give us a chance to understand the motivations behind both why and how she transformed from innocent girl into bloodthirsty monster. It highlights the very act of transformation, which is itself both powerful and evocative of a mystical process that alters the aspect and dynamics of the soul in question. And it gives us resolution when both halves of the girl are eventually reunited and given the chance to pass on, washed clean of regrets and despair. For those with a healthy interest in ghostly Japan, this is a series that highlights one of the more powerful concepts. The defense mechanism Yuuko develops is the root cause of her amnesia. When the shadow hand touches her, her mind wipes clean, thereby eliminating her own fear. 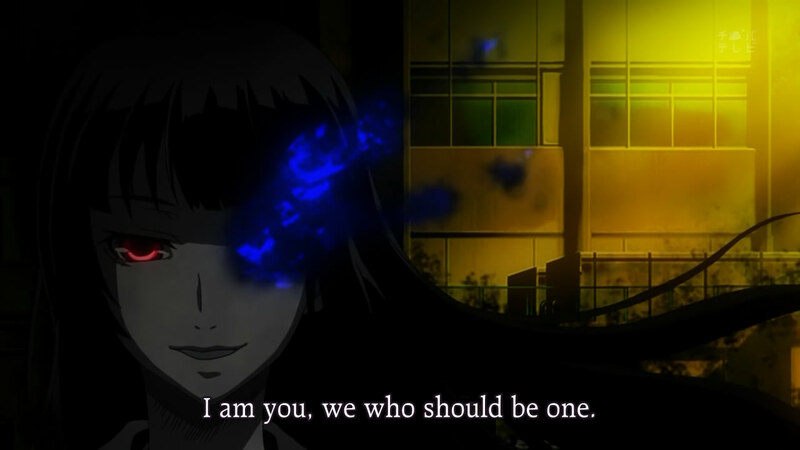 In a way, Kage-yuuko is herself a defensive entity, despite seeking vengeance "on her own time. In the general broad-strokes of its plot foundation and theme, I found Tasogare Otome to be similar to Ano Hana. What made me very pleased is that the ending took what I would call a much more happy and satisfying route than Ano Hana. It greatly surprised me because I thought it would be a very formulaic conclusion. I was so excited to see it get mixed up in a way that fit perfectly with the tone that was set in the rest of the series. I've heard people rail against the "copout" ending, and people praise it as well. Personally, I almost cried when Niiya and Yuuko were reading the book, and I felt genuinely bad for them, especially since he spent half the series trying to come to grips with his feelings for her. So I didn't mind as much when she "came back." Though chalking that up to "new regrets" strikes me as odd, since most of the source myths I've read claim that you need to be alive to build the regrets, especially when the second set occurs post-mortem, and is unrelated to the first. I still enjoyed it though. I could only imagine what would happen were there an onmyouji in the club, like the character in Ghost Hunt. I didn’t watch this Anime before but it think it’s nice because Japanese anime are great there is always a stories behind the battles.